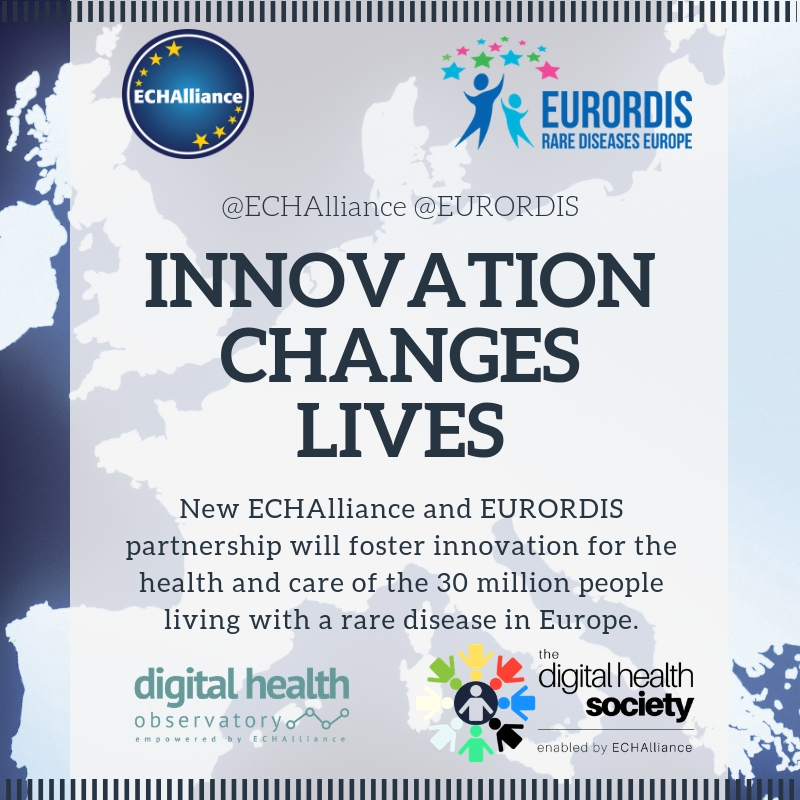 EURORDIS-Rare Diseases Europe and European Connected Health Alliance (ECHAlliance) announce a long-term strategic partnership to develop awareness on rare diseases, to promote initiatives aiming at accelerating innovation to improve access to information, quality diagnosis, treatment and multidisciplinary care and research for rare diseases. The development of training courses and capacity building activities where patients can help to articulate rare disease perspectives in policies. For further information please contact Denis Costello, EURORDIS, denis.costello@eurordis.org, or Brian O’Connor, ECHAlliance, brian@echalliance.com. EURORDIS-Rare Diseases Europe is a unique, non-profit alliance of over 800 rare disease patient organisations from more than 60 countries that work together to improve the lives of the 30 million people living with a rare disease in Europe. By connecting patients, families and patient groups, as well as by bringing together all stakeholders and mobilising the rare disease community, EURORDIS strengthens the patient voice and shapes research, policies and patient services. Follow @eurordis or see the EURORDIS Facebook page. For more information, visit eurordis.org. The European Connected Health Alliance (ECHAlliance) is the Global Connector, facilitating multi-stakeholder connections around ecosystems, driving sustainable change and disruption in the delivery of health and social care. Our global network of Digital Health Alliances connects 78 countries and 4.4 billion people (Europe, USA, Canada, China, Africa, Asia, the Caribbean and Americas and the Pacific). Our community of over 16,500 experts – including government, health & social care providers, leading companies and start-ups, researchers, insurances, patients groups and citizens, and the investment community connect through ecosystems meetings (100+ per year), international events and our online platform, “Connector”. The Digital Health Observatory (DHO) and The Digital Health Society (DHS) movement facilitate and promote the transfer of knowledge, experiences and best practices creating a community of knowledge in Digital health Globally.